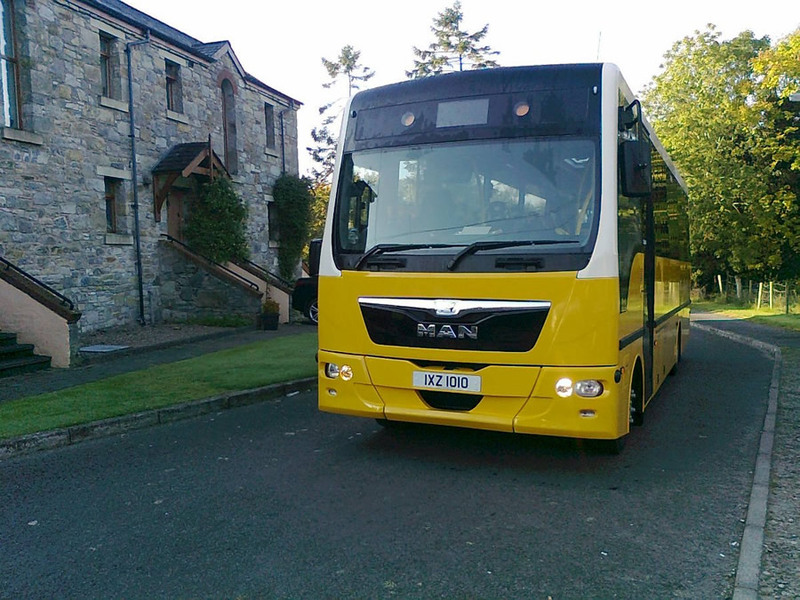 The Education Authority in Northern Ireland provides bus transportation to students who live a stipulated distance from their school. 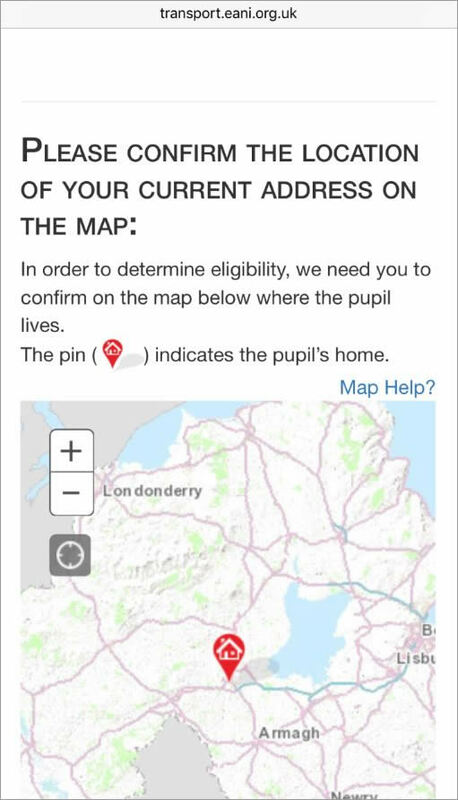 Parents in Dungannon, Northern Ireland, can now use an ingenious GIS-based web app to check if their children are eligible for school bus transportation and then apply for it online. Developed by Esri Ireland for the Education Authority, the School Transport app was enthusiastically received by families that participated in a highly successful pilot study. Located 42 miles east of Belfast, the Dungannon district has a population of about 58,000. The Education Authority is required by law to provide transportation for students who live more than a stipulated distance from their school. For primary school students, the stipulated distance is two miles, and for post- primary school students, it’s three miles by the shortest walking route. In some cases, the bus transportation is free to the students, and in other cases, the Education Authority provides families with some financial assistance that can go toward transportation costs. Northern Ireland is a predominantly rural country and, as a consequence, more than 90,000 children are eligible for free school bus travel. Every summer, the Education Authority must consider in excess of 25,000 new applications for bus transportation in time for the start of the academic year. It is a very complicated process, which involves having the Education Authority measure (sometimes manually) the walking distance to school for each individual applicant to ensure that all decisions about whether or not to fund transportation are made both quickly and fairly. Until recently, this entire process was driven by information collected and communicated in paper-based forms. To make the process easier, the Education Authority approached Esri Ireland and asked it to use Esri’s GIS technology to create a web-based app that would be mobile friendly and accessible 24/7. Developed using Esri’s ArcGIS platform, including ArcGIS Online, the solution integrates live Ordnance Survey map services and address data from Land & Property Services (LPS). When parents log in to the app using a mobile device, such as an iPhone, or a web browser on a desktop, they can see the name of their child and a map view that shows the street where he or she lives, along with an arrow that marks the assumed location of the house or apartment. If the arrow is in the wrong place, parents can simply slide it using their touch screen or pointer to indicate the precise location of the property. This nifty app gives parents the ability to measure the distance from their home to their child's school. When parents tap or click the Submit button, the GIS-based app automatically calculates walking distances to their child’s school. If the child is clearly eligible for bus transportation, parents receive an instant yes response, and their application is automatically forwarded to the Education Authority’s transportation team. But if the student is clearly ineligible to ride a school bus, the parents are immediately notified online via the app and by email. In other cases, such as if a student lives in an area marginally outside the eligible distance, the applications are forwarded for more detailed consideration. “It’s beautifully simple yet a terrific demonstration of the power of digital geography,” says Eamonn Doyle, chief technical officer at Esri Ireland. 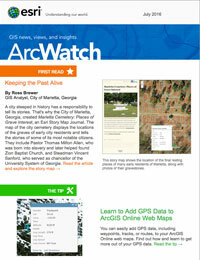 In a related initiative, the Education Authority used Esri’s ArcGIS Online to develop a new interactive web map of bus routes. Consequently, now, when students are allocated a place on a bus, parents can look online to easily find their nearest bus stop and check departure and arrival times. The School Transport app has transformed the quality and availability of information for parents. In most cases, parents can get an instant answer to the question: Is my child eligible for school transport? The Education Authority can now operate more efficiently in the pilot area of Dungannon, as it no longer has to waste time processing applications from parents who have used the app and discovered that they are not eligible.